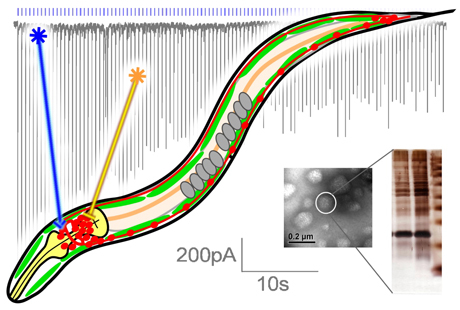 We use optogenetic tools to study neuronal circuits, and we combine their use with automated, quantitative analysis of worm behaviour to study the function of individual neurons. In addition, optogenetics largely facilitate our analyses of synaptic transmission. Additional optogenetic tools we use are variants of Channelrhodopsin with new properties and a photo-activated adenylate cyclase to photo-manipulate cAMP levels. Biochemical purification and mass spectrometry of neuronal protein complexes (or organelles) allows us to identify unknow proteins acting in synaptic transmission. Electrophysiology at the neuromuscular junction (NMJ) is crucial to properly analyze chemical synaptic transmission. Despite the small size of C. elegans (1000 x 80 µm), the NMJ can be prepared by dissection in a functional manner. We combine electrophysiology and optogenetics, as optical stimuli are precise and non-invasive triggers of transmitter release. Cell-surface immunostaining of proteins in live animals. This method involves injecting antibodies into the body cavity of C. elegans, to analyze expression of plasma membrane proteins and their proper trafficking to the cell surface, or their anchoring at synapses.